The Bank Committee meets in the old NAB branch Nightcliff. After 12 months of trading, the Nightcliff Community Bank® has been able to deliver the anticipated results, making supporting donations to several local groups. Sids 4Kids NT, Autism NT, Camp Quality NT and the Nightcliff Cricket Club all benefited from bank profits recirculated back into the community. The Nightcliff Community Bank® has opened to provide full banking services to Nightcliff and surrounding Darwin suburbs. Support from local residents and businesses in conjunction with Bendigo Bank has enabled the opening of the 223rd Community Bank in Australia. As a result of successful local fundraising, and the green light given by a formal feasability study, Nightcliff Community Enterprises Limited was formed to establish a Community Bank® in partnership with Bendigo Bank in the Nightcliff area. Gavan Keane, chairman of the Nightcliff Community Bank® Steering Committee, announced the appointment of chartered accountants AFS and Associates as consultants for the forthcoming feasability study. "I am really delighted with this appointment," Gavan said. "AFS helped with the highly successful launch of the Coolalinga Community Bank®, and have been consultants to about 150 other Community Banks®." As part of the feasablity study, survey forms will be delivered by mail to residents of the area this week. 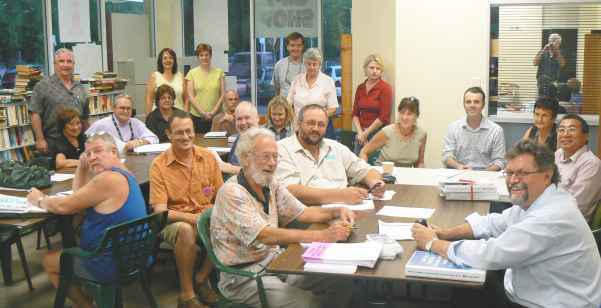 Nightcliff bank committee gathers to establish a local bank. Since the closure of the NAB in Nightcliff and the ANZ in Rapid Creek, this area has been without a bank. This group has established a committee with the aim of establishing a bank in the local community, owned by members of the local community to benefit the local community through profit sharing with local community organisations. This model of community banking has been successfully established in many places in Australia, both in the suburbs of the capital cities and in smaller country towns where the withdrawal of the "big Banks" has been disastrous for the local community. At this stage the bank committee needs to gather support from the community to prove that a bank would be viable in the Nightcliff area. 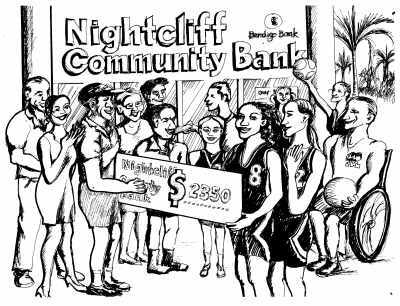 Click here to say why you think Nightcliff needs a community bank. Community banking benefits the local community. The proposed Nightcliff Community Bank® has just about taken its first step. As the graph above shows, the Bank has almost reached its targets of 350 shareholders, and $700 000 in pledged shares. The Steering Committee expects to reach these targets within the next week or two, and is actively preparing for Phase Two: the Feasibility Study. During Phase Two, a firm of independent consultants will be appointed to talk to local residents, and to make sure that the bank really has enough support to be able to succeed. It is hoped that this Feasibility Study will be completed within the next month or two. Assuming Phase Two gives the green light to the project, a formal business plan will then be prepared, detailing exactly where and how the bank is to be set up,and what profits can be expected. Next, a formal Prospectus is prepared, which goes to the Australian Securities and Investments Commission (ASIC) for approval. Once approved, the Prospectus is circulated, and pledgees are invited to buy shares. Finally, once enough shares have been sold, the share issue is closed, and the Nightcliff Community Bank® is launched.